At Comic-Con in San Diego this summer, the teaser poster for Edgar Wright's next film The World's End, the third part of the Three Flavours Cornetto trilogy, premiered with a simple list of bars. Now the titular pub is featured on a new poster that promises "Good food. Fine ales. Total Annihilation." It's another simple teaser poster, but that's just fine with us. It's the return of Simon Pegg and Nick Frost in this story of five childhood friends who reunite after 20 years and get convinced to re-stage a legendary night of drinking by Pegg's character, a 40-year-old man eternally trying to relive his teenage years. As they attempt to reconcile the past and present, they realize the real struggle is for the future. We can't wait. Poster below! 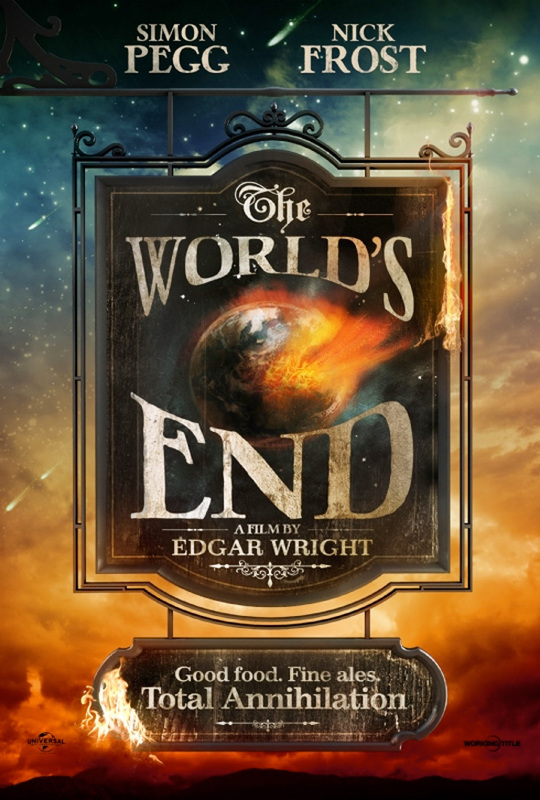 Edgar Wright (Shaun of the Dead, Hot Fuzz) is writing and directing The World's End, third part of the Three Flavours Cornetto trilogy, starring Simon Pegg and Nick Frost. 20 years after attempting an epic pub crawl, five childhood friends reunite when one of them (Pegg) becomes hellbent on restaging a drinking marathon and reach the fabled pub, The World’s End. As they attempt to reconcile the past and present, they realize the real struggle is for the future, not just theirs but humankind’s. Paddy Considine, Martin Freeman, Rosamund Pike and Eddie Marsan also star in the film hitting theaters on October 25th, 2013.